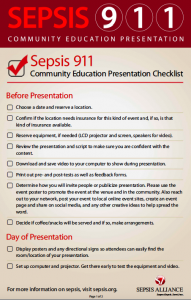 The Sepsis 911 Community Education Presentation is a leader-guided presentation that allows anyone (members of the public, health providers, educators) to share information about sepsis with their community. Grassroots initiatives like this help more people learn about this life-threatening condition and we know that being knowledgeable about sepsis can help save lives. Thank you for raising sepsis awareness in your community! If you have questions, need any support, or have any feedback on the presentation materials please email us at info@sepsis.org. 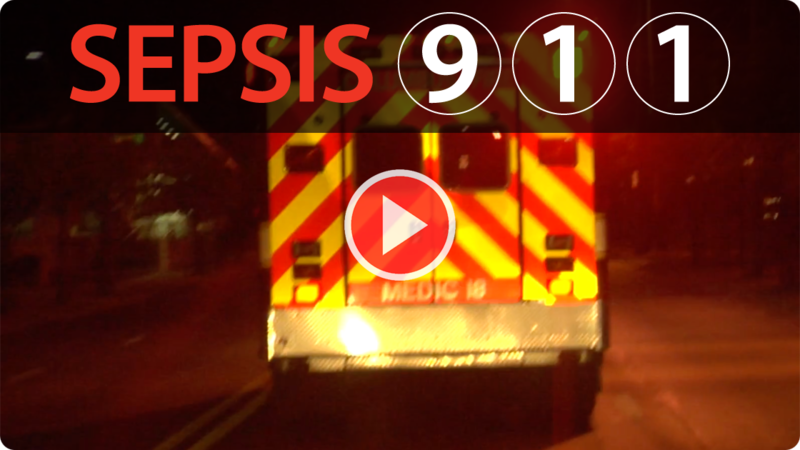 New offering: Sepsis 911 and Aging Community Education Kit. Click here to get the education kit for older adults. These terms and conditions govern your use of Sepsis Alliance (SA) files. If you do not agree with these terms and conditions you may not use the files. Unless otherwise stated, SA owns the intellectual property rights for all files. You may view, download and print files for personal use, and distribute for educational use. Republish or reproduce the information included in the files. Sell, rent or sub-license any material. You may download, print and distribute any files for educational or personal use.